O Tor Des Géants é uma prova maior do que a vida. É toda ela excessiva, exuberante, barroca, gigante. 330 km com 24.000 mD+ (desnível positivo) para serem completados num tempo máximo de 150 horas (6 dias e 6 horas). Com passagem em picos com altitude superior a 3.000 m, em terreno difícil, sob condições climatéricas adversas. Acompanhei esta edição de 2015 com o maior interesse e emoção. 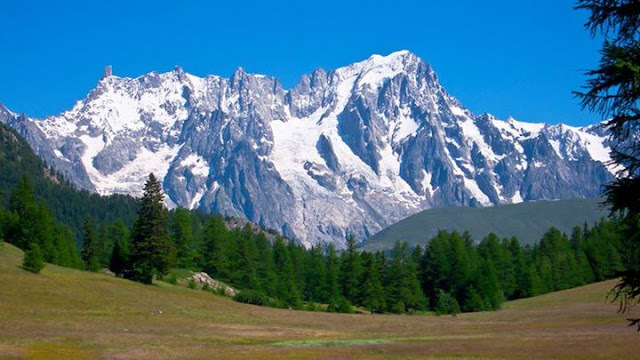 Vivi cada minuto como se estivesse lá, em prova, com todos os Gigantes que se atreveram a desafiar a montanha, o Vale D’Aosta e os seus 4 ferozes guardiões: Le Grand Paradis, Le Mont Blanc, Le Mont Cervin e Le Mont Rose. Segui de perto a Magnífica Armada Lusa, com os nossos Heróis Nacionais, e com eles sofri as desventuras e alegrias do caminho. Este ano a prova foi marcada por condições meteorológicas particularmente inclementes, que tornaram o percurso ainda mais duro do que noutras edições anteriores e forçaram a organização a decretar duas interrupções na prova em dois momentos especialmente penosos. A segunda interrupção seria convertida em cancelamento, uma vez que as condições meteorológicas não faziam menção de melhorar. Esteve parada das 04:00 às 07:00 de 2ª feira dia 14. E novamente suspensa ao fim do dia de 4ª feira, dia 16, quando ainda só tinham cruzado a meta os 6 primeiros classificados. Foi cancelada definitivamente às 08:30 de 5ª feira, 94,5 horas depois do início. Em 2012 devido à meteorologia e para garantir a segurança, os últimos 30 km foram anulados (a partir de Saint-Rhemy en-Bosses 303 km). 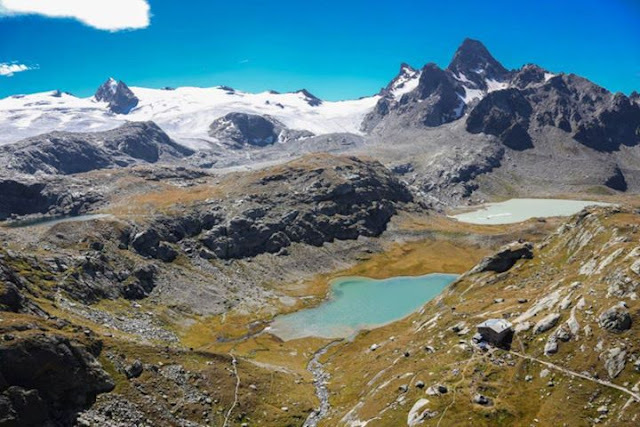 Em 2015 devido à meteorologia e para garantir a segurança, a prova foi cancelada quando se tinham cumprido oitenta e poucas horas de prova, e apenas 6 atletas tinham cruzado a meta em Courmayeur. 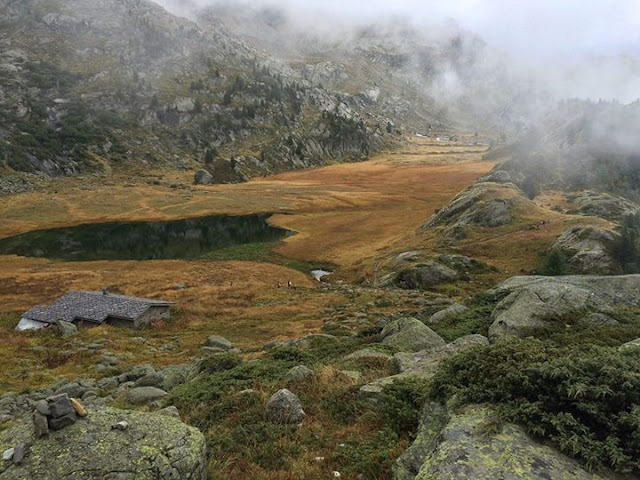 Todos os que chegaram à base de vida de Gressoney (km 200) foram classificados. De seguida seguem as notícias publicadas pela organização, no site da prova, e por ordem cronológica com um flash-back (analepse) inicial para os resultados das duas edições anteriores. 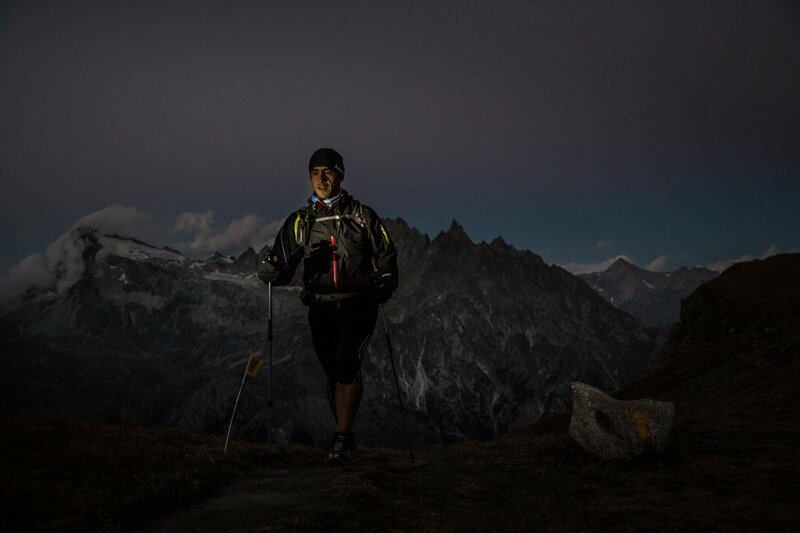 Iker Karrera just entered into the exclusive circle of the winners of the Tor des Géants®, the hardest endurance trail of the world.This morning at 8.21, the Spanish runner has concluded his fantastic, 330 km long , solitary run, arriving at Courmayeur with the record time of 70h 04’ 15’’. Almost 6 hours less than Oscar Perez, who has won the edition of 2012 arriving at 13.56 then. Second behind Karrera is actually Oscar Perez who stopped the chronometer at 70h e 29’, just 25 minutes after the winner.Fantastic third place for the native athlete Franco Collè, arriving at 10.22. Collè for a certain moment also was in head of the competition. 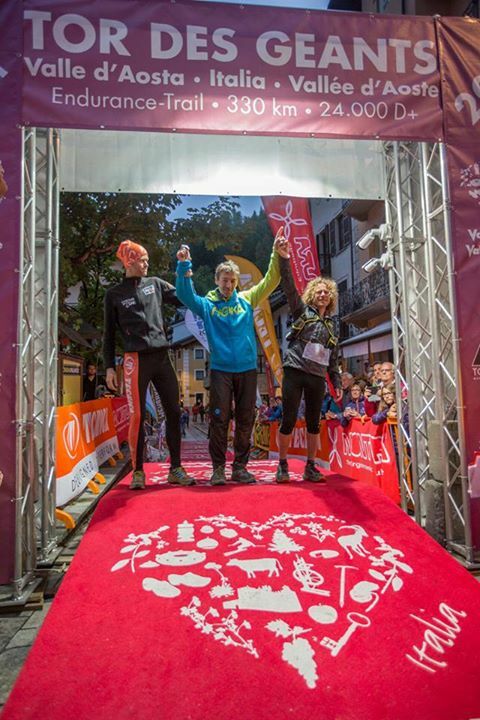 Iker Karrera celebrated in a very moderate way his victory, remembering with tenderness and emotion the deceased Chinese runner Yuan Yang.He dedicated his victory at his wife who had assisted him during the race. 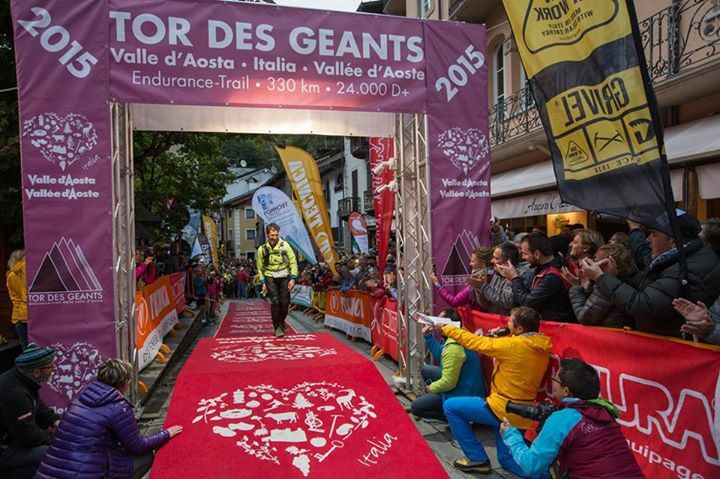 Franco Collé is the king of 2014 Tor : the Gressoney runner wins his first Tor des Géants in 71h and 49 minutes! 2 pm was the time for the bibs given out, but, at the Forum Sport Centre of Dolonne there was a (rapid and fluent) line from 12.30. It was an intense afternoon, today: checks of compulsory materials that every runners has to take in his backpack, interviews with athletes and organizations from international tele- visions ( as the Japanese NHK), sponsors and, from 8 pm, the pasta party and the briefing where the final weather forecast are to be presented to the athletes. At 6, at Jardin de l’Ange, took place a crowded ceremony for the given out of the bibs to the Top Runner Athletes of this edition. Women first, as it should be: Cecilia Mora, world trail running champion, Marina Plavan, 4th place last year and, of course, Denise Zim- mermann ( Swiss, 3rd in 2014 and at the recent UTMB) and Lisa Borzani ( 2nd in 2014). As for men, a big group of aficionados such as Pablo Criado, Oscar Perez, Christophe Le Saux ( who has been on Tor podium) and the Japanese Masahiro Ono, Schogo Mo- kizuchi and Lini Wataru (at his debut at Tor but who won several international races). Then, big Irish name: Dan Doherty and Eoin Keith. There is also a French: Patrick Bo- hard. He defined Tor a “devil race”, but a lot of people think he is going to be the one who is going to take the devil for the horn. It is one of the favorite, but, of course, the race will decide. 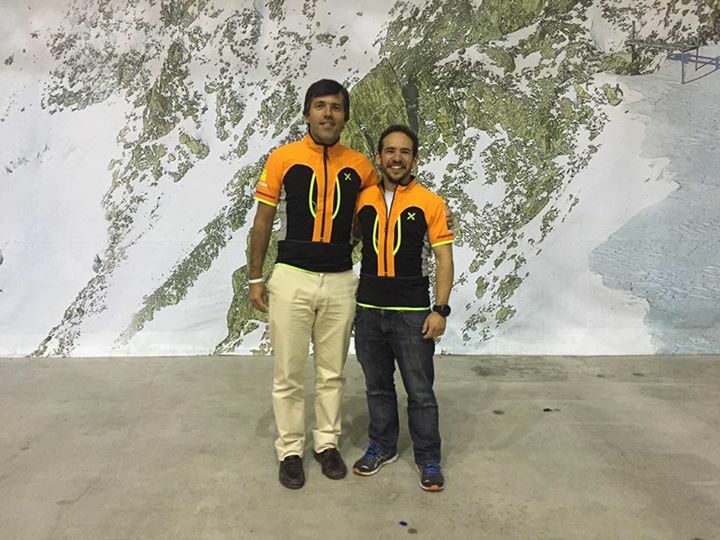 Last but not least, Matteo Pigoni and Gianluca Galeati: they will be able to shine. And the, naturally, the beloved athletes from Aosta Valley: Abele Blanc, Giancarlo Anno- vazzi, Giuseppe Grange and the always strong Bruno Brunod. SIXTH EDITION OF TOR JUST STARTED! 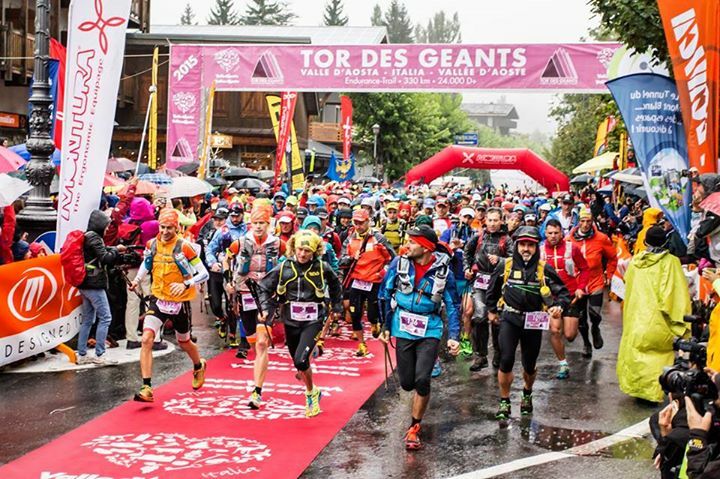 This edition of Tor des Géants started at 10 am sharp, preceded, for the second year in a row, from the colorful start of I Maratonabili. Even if it is raining, the race has no variations for now: if there will be any different indications, they will be given to the runners at Rifugio Deffeyes. As usual, the race can be followed live here. Luck is with the brave. At least for now. 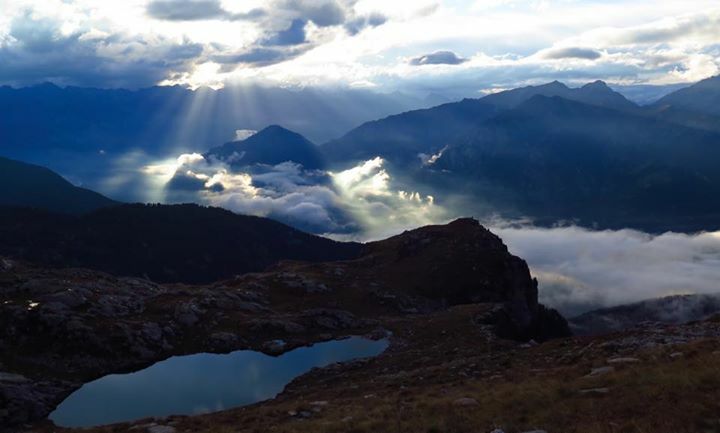 After a start at 10 am under an heavy rain, low clouds and a not so bright weather in sight, the 760 runners found in La Thuile, 17 km after, some rays of sun. 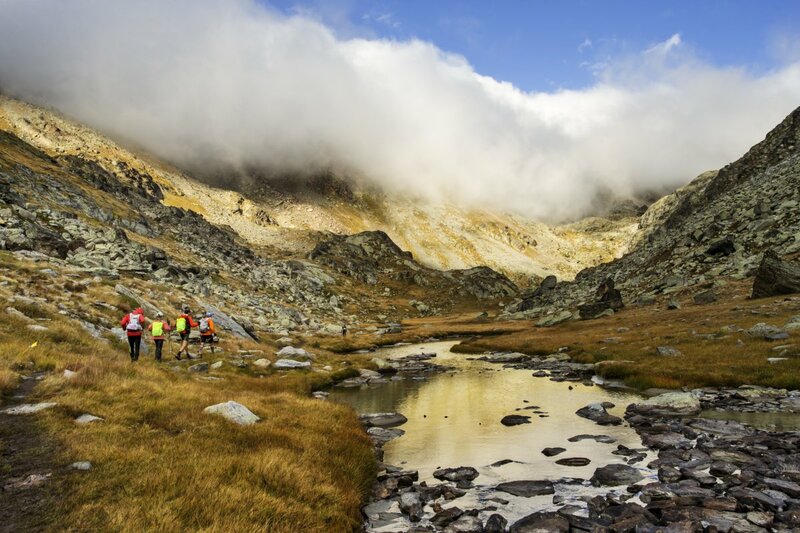 Clouds went high and so it was no trouble for the first runners to go up and down from Col de la Crosatie; in fact, there was no need to go for plan B and change the “normal” path of Tor. At the check point of La Thuile the first two withdrawals: bibs number 988 and 989. 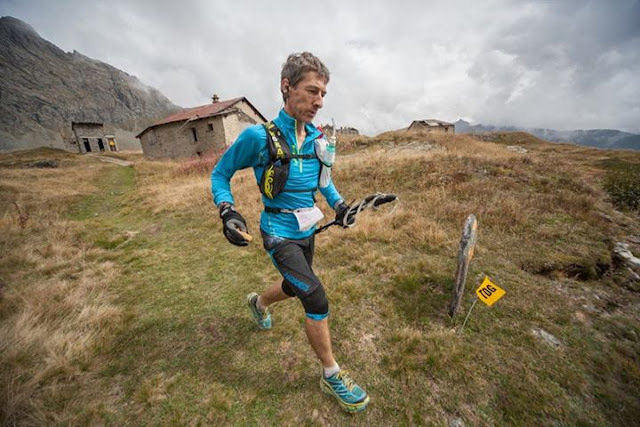 In La Joux, just before going up to Deffeyes, Christophe Le Saux took the head of the race, while Lisa Borzani was the first woman with no big effort. 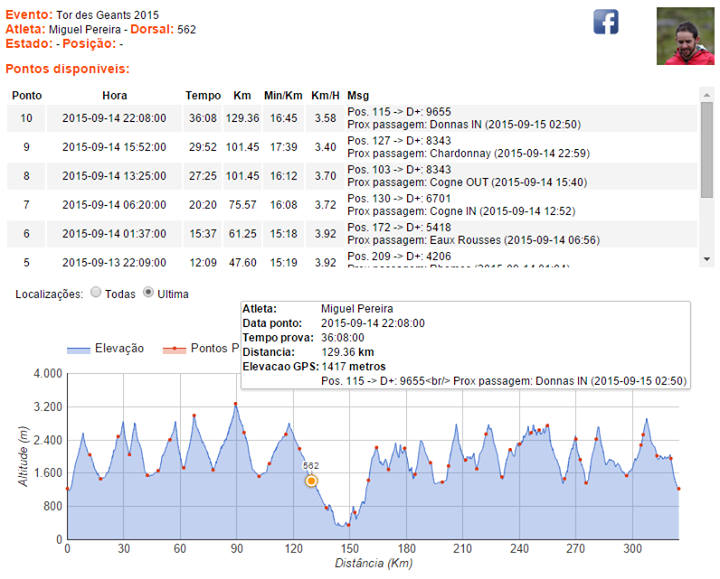 In the next few km of up and down the head of the race experienced some changes. 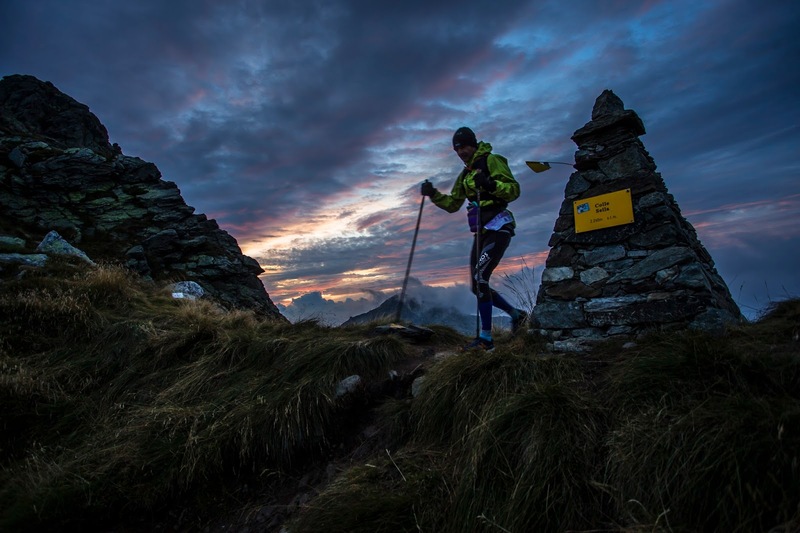 In Valgrisenche, first life basis at 48,6 km from the start, among a great number of people, Patrick Bohard was the first runner to check- in at 5.30 pm. Just the time to change clothes, with his assistance, in a scene that seemed to be pretty common for them. Four minutes later, it was time for Gianluca Galeati: smiling and quiet, he even found time for some short interviews. In third place Dan Doherty, three minutes later: without any assistance, he immediately managed to eat something.Christophe Le Saux was in 4th position at 5.40 pm. 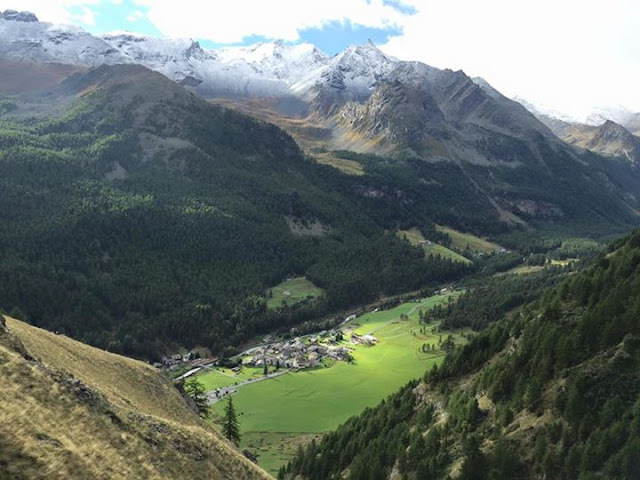 ￼Bohard left Valgrisenche a at 5.41pm with Le Saux yelling and smiling: “ Patrick wait for me!”. The 51 years old from Au Chauffaud, Villers Le Lac, just didn’t pay him attention and continued his long journey. It was then time for Pablo Criado and Peter Kienzl ( 27th in La Thuile). In 7th place,Matteo Pigoni, athlete from Lambrusco. As far as women are concerned, up at Col de La Crosatie women were close one to each other and in this posi- tions: Denise Zimmermann ( Swiss), Sonia Locatelli and Lisa Borzani. 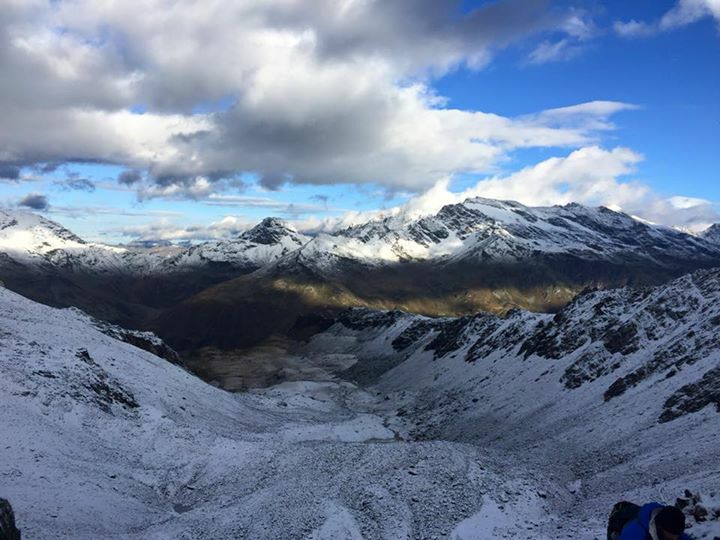 Down at the life basis of Valgrisenche something changed. In first position, with a huge support of the whole crowd, Sonia Locatelli, at 6.32 pm. 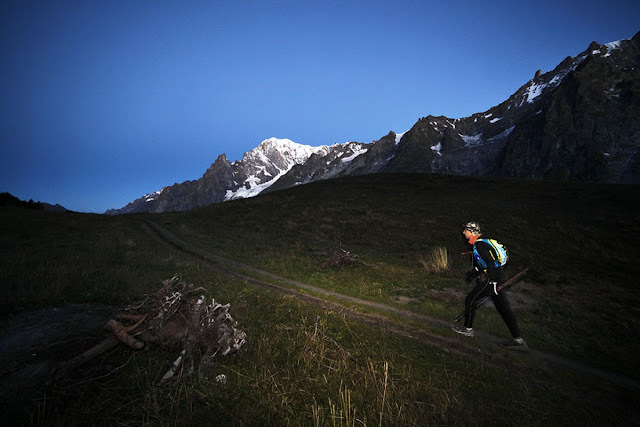 Denise Zimmermannfollowed her six minutes later: a little bit tired in her legs, she said, due, maybe, to the recent 3rd position in Utmb ( or maybe remembering that last year that leg was bitten from a dog...thing that did not stop her to get the 3rd place in the women ranking). Lisa Borzani, from Padova, arrived quickly in 3rd position and went in for a brief rest at 6.42. Pics: Patrick Bohard, first in the overall ranking, at his entrance in Valgrisenche. 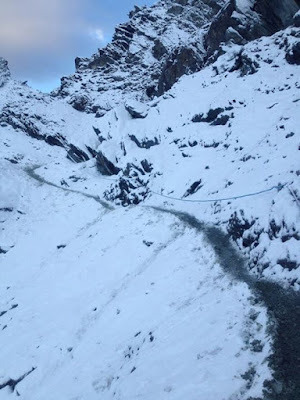 At 7am, with a mostly sunny day, the race started again regularly after a 3 hour stop tonight in order to check the water of a stream between Col Fenetre and Rhemes. 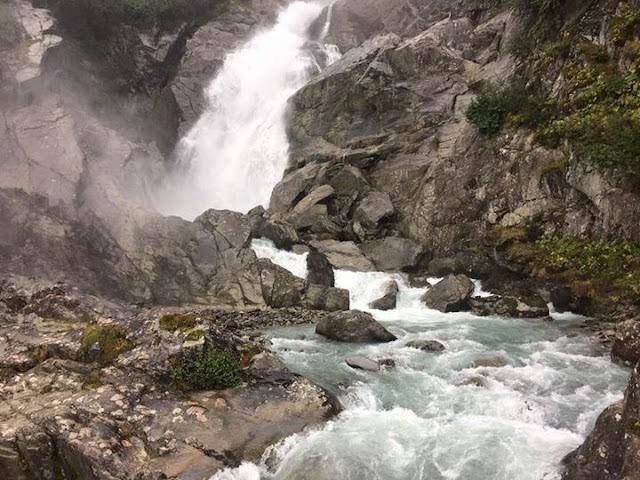 The stream went dangerously big after the heavy rain of the night, so the guides went up to create a safer way for the runners. The chief of the healthcare coordination communicate that there has been no significant intervention. 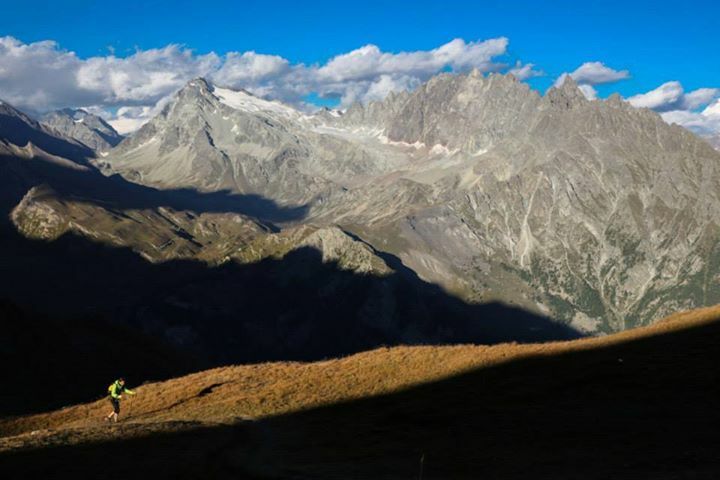 The head of the race was already after that point as they already reached Cogne and left it after a brief stop. Today, as said, it is a sunny day so it should be a warmer and drier race day. Time deadlines will be postponed to regain the three hour stop of the night. We would like to communicate to everyone who is following friends and relatives that Col Loson is, from the beginning of the race and until the transit of the last runner, controlled by 3 men of the State Forestry Corps and 2 Alpine Guide in order to guarantee the safety of all the athletes. 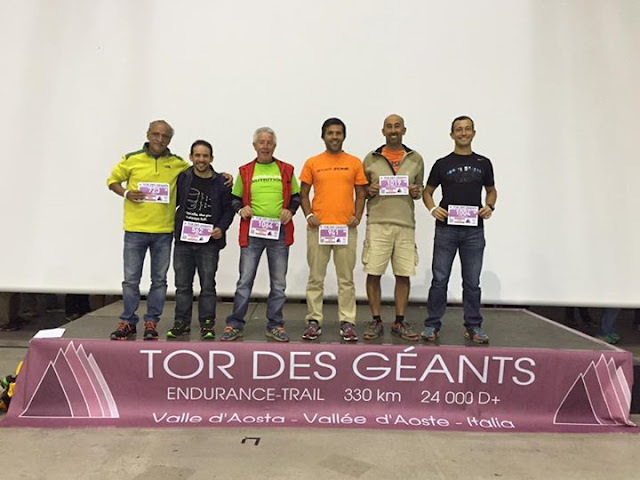 Tor Organization would also like to thank the managers of Hotellerie Du Paradis ( Eaux - Rousses) that, tonight, gave the hall and some hotel rooms to guarantee a warm and dry place for the runners who were forced, for safety reason, to stop in Eaux Rousses. Eaux- Rousses refreshment points was, at that point, overcrowded and their nice gesture had been truly appreciated! Time deadlines, due to the 3 hours stop of last night, are postponed of 3 hours for all the runners. 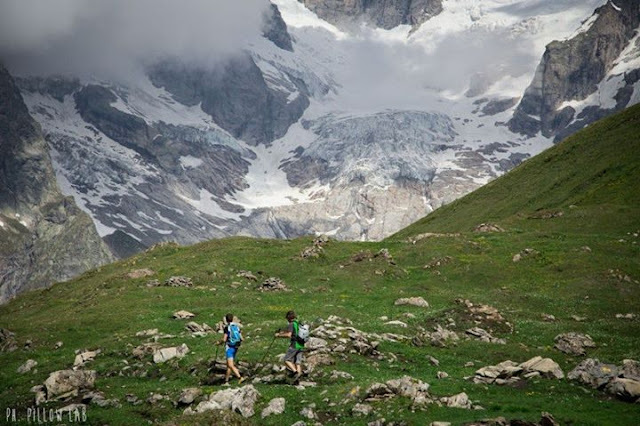 First runners already passed the half race and are going back running towards Courmayeur; they are going to battle for the first place until Wednesday morning. In the meantime the “heart” of the race is going down to Donnas, the most east part of the path, while the last athletes are still dealing with the high pass of Entrelor and Loson ( more than 3000 meters high, with their peak white with snow). (with the exception of the head of the race who already passed that point before) were forced to stop at the refreshments of Eaux Rousses on in the previous life basis. This made refreshments points extremely crowded: a nice hotel manager even opened up the hall and some rooms of his hotel in order to give a warm and dry place to stay for the runners. 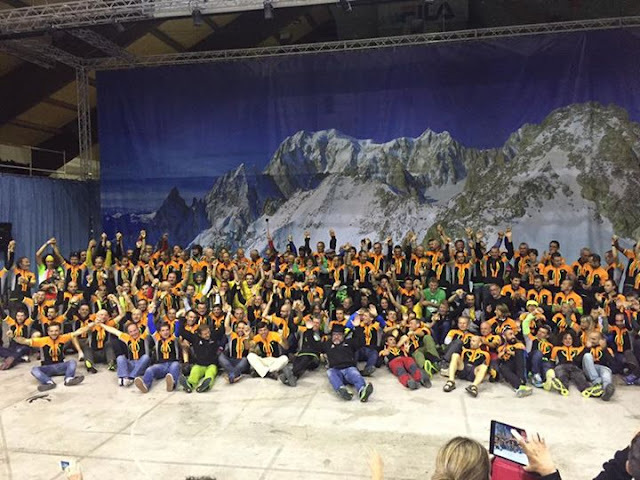 Very much appreciated from runner and organization, signature of the great involvement of the whole Aosta Valley. This three hours stop obviously led to the decision of postponing all the time deadlines of three hours. The race started again at 7am allowing all the athletes to go up to Col Loson ( 3299 meters) where, since the beginning of the race, 3 State Forestry Corps and 2 Alpine Guide are looking after the safety of the runners. There were no big injury or issues during this night, just some runner slipping because of the fatigue or because of lack of concentration. 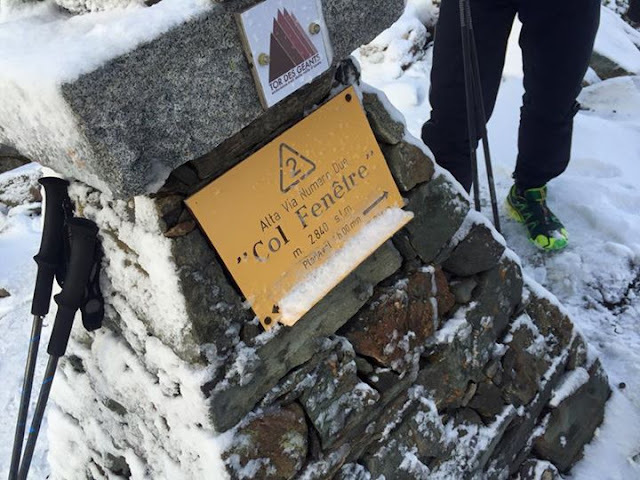 During the day, a Portuguese runner was taken from Col Entrelor to the Aosta Hospital with signs of hypothermia: he was checked-in as a white code, and his conditions do not race concern. 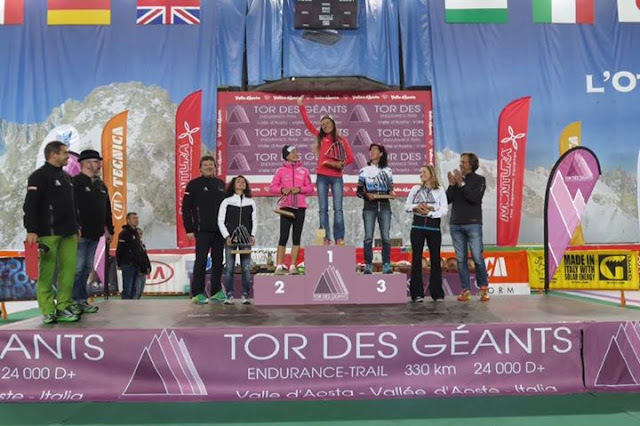 In Cogne, Sonia Locatelli withdrew due to stomach pain. She left the battle for the first place in the hand of the Swiss Zimmermann and the Italian Borzani who are running almost at the same speed. Of course, the race is still long. 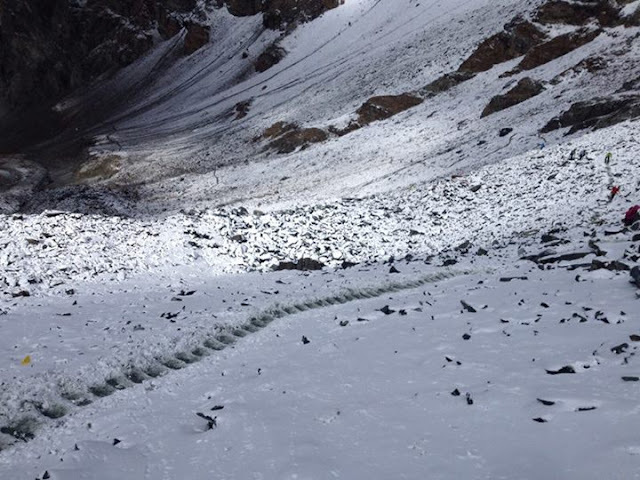 Withdrawals are around 50 now, mostly due to too much fatigue and cold of the highest passes. Race keep going: an eye is still up to the sky for the uncertain weather condition. Tor lost today one of its main character, the Irish Dan Doherty, who withdrew on the path who went from Valtournenche to Rifugio Barmasse, around the 240 km. The withdrawal was due to a knee injury. The first in the ranking is always Patrick Bohard: no issues for him, he is just proceeding a little bit slower. After him, Masahiro Ono ( Japan) and Oscar Perez ( Spain) are speeding up and are gaining positions. Perez himself two years ago did a huge recovery and arrived in second position. Between them and the first, Gianluca Galeati who is now in a virtual third position on the podium when less then 100 km are left for him to the finish line. The arrival of the first is expected around the half morning of tomorrow: time of the race is around 2 hours more than last year. So, the podium is still uncertain: this end of the race is gonna be breathtaking! In the women ranking Denise Zimmermann is always leading, now 13th in the overall ranking, followed from Lisa Borzani ( 20th overall) and then Marina Plavan. Of course everything can still change: previews are of little value in a race like that. 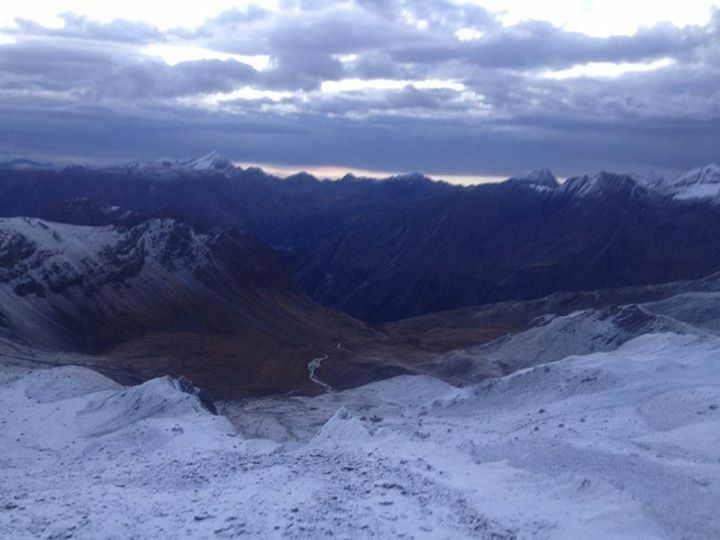 The weather forecast are talking about rain for tomorrow with snow above 2800 meters. Luckily just Col Malatrà is above this highness with its 2963 mt. Security men are already looking after Malatrà to make it safe for the arrival of the runners if snow should come. As far as the other part of the race is concerned, no big issues a part from some natural tiredness. Athletes seems to be for the most in great shape, sign of a good physical and mental preparation to the race. The medical equipe did not have much work today too: just two rescue on the paths for knee injuries or too much fatigue. Everyone was seen and released, included the Portuguese runner that two days ago had signs of hypothermia. So, everyone keep running. Eyes to the sky, eyes on the weather. As usual, on this edition of Tor. All the athletes are now on the second half of the race, on their “way back” to Courmayeur: Donnas life base was in fact closed this morning at 6am. 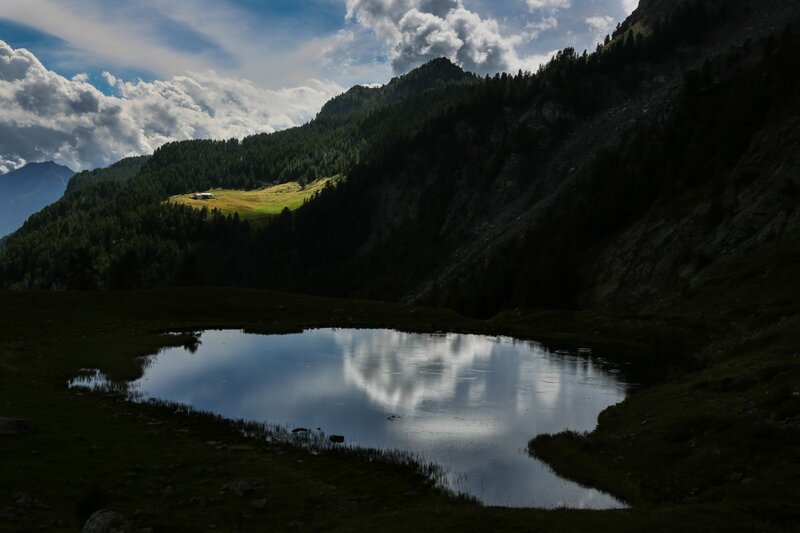 The last part of the runners is going up towards Rifugio Coda and from there down to Gressoney, while the first, Patrick Bohard,passed Ollomont ( 283, 5 km) and Col Champion ( 2709 meters) before dealing with a slope down to Saint Rhémy en Bosses. From there up to Malatrà ( 2936 meters), the highest peak on the “way back” but also the last the big descended towards Bonatti, Val Veny and finally Courmayeur. 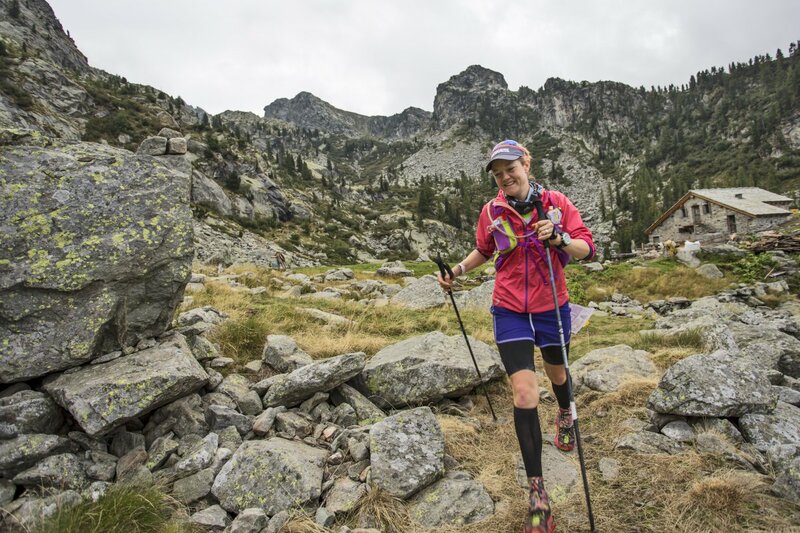 Denise Zimmermann left Rifugio Cuney ( 256,7 km) at 8.40, first woman in the ranking. It rains on the paths, but the snow did not come fon now. The highest peak is already under the control of the Organization. Last night, quite a bunch of withdrawal due to cold, humidity and tiredness. The race keeps going even if, of course, slower than the last years. Patrick Bohard, 51 years old from Villers Le Lac ( Le Jura) is the winner of Tor des Géants 2015 with the time of 80 hours and 20 minutes, almost a record, if you match it with the hostile weather. 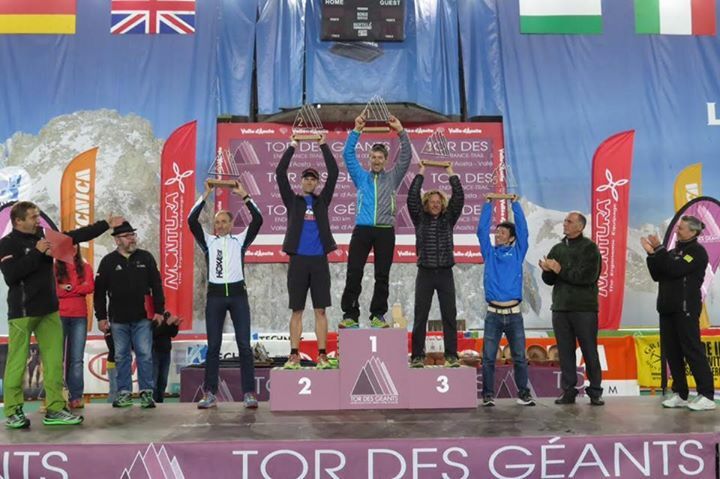 The French athlete was among the protagonists of Tor 2013, when he finished the race in 5th position with a time of 78h47m after a beginning of the race that he defined “a catastrophe”. This year he run with more attention to alimentation and with a strategy that was to do the first part of the race with more cau- tions and give it all in the second part. This is more or less what happened during his Tor, even if, of course, the bad weather changed his plan a bit. 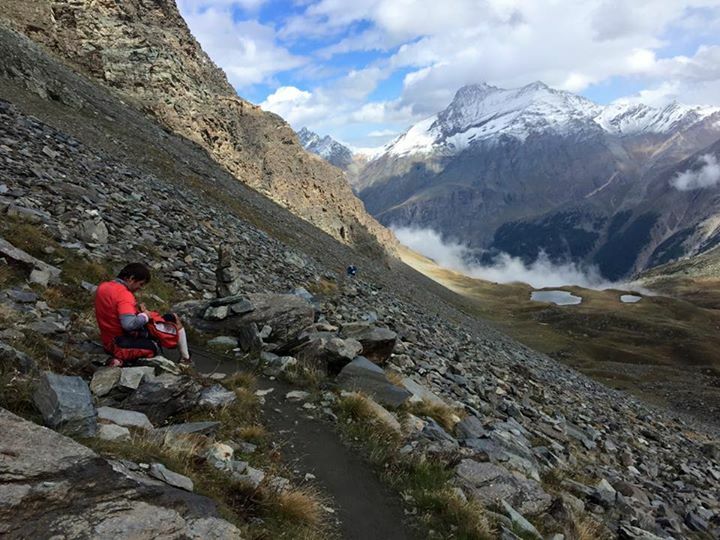 Patrick was in Aosta Valley in July to train on the path between Courmayeur and Donnas and in August for the part between Donnas and Courmayeur. “I came mostly to get used to the high quote; in Jura, where I live, peaks do not go higher than 1700 meter. 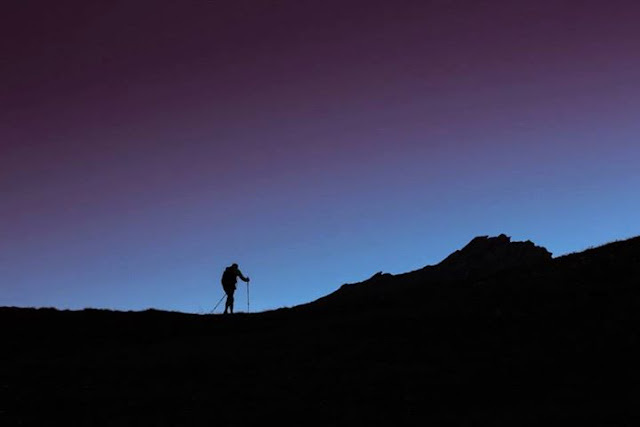 Tor des Géants, instead, is 100% mountain.” Bohard, anyway, trained all year long on the Jura, including a cross-country ski performance of 272 km in 22 hours. This French athlete, who for a living is a Hotel Manager and who started run- ning just in 2008 ( thing that teaches that there is no need to be young to arrive to big achievement), arrived at the finish line tired but happy. Not a big talker in general, he was not at the finish line either. Great was the commotion and the thanks to the whole Aosta Valley which supported him all along the race. 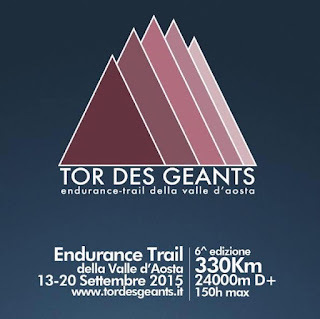 Second position for Gianluca Galeati, born in 1983, member of Team Tecnica and coming from San Pietro Terme ( Bologna) He started running 7 years ago, passing briefly from the road to the paths. 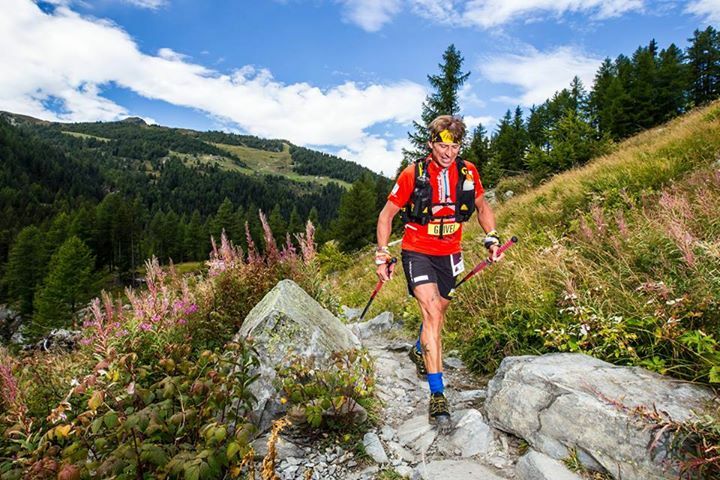 In the big international races, such as 2013 Utmb, he has always been in the first positions among the Italians. At Tor he already was 7th last year, position that he definitely improved this year arri- ving just 24 minutes after the winner. It looks like a lot, but it is a very small di- stance in a 330 km race. For a living, he is a quality controller: here, he showed all his own quality. At the finish line a very special dedication to his next coming daughter and a big thanks to the organization and the volunteers that helped him realize a dream in truly hard conditions. To welcome him, his companion and Franco Collè, win- ner last year, who seemed to be even more moved than his “colleague” in the race. On the third place of the podium another French, Christophe Le Saux, welcomed with huge applauses, with a total time of 81 hours and 19 minutes. 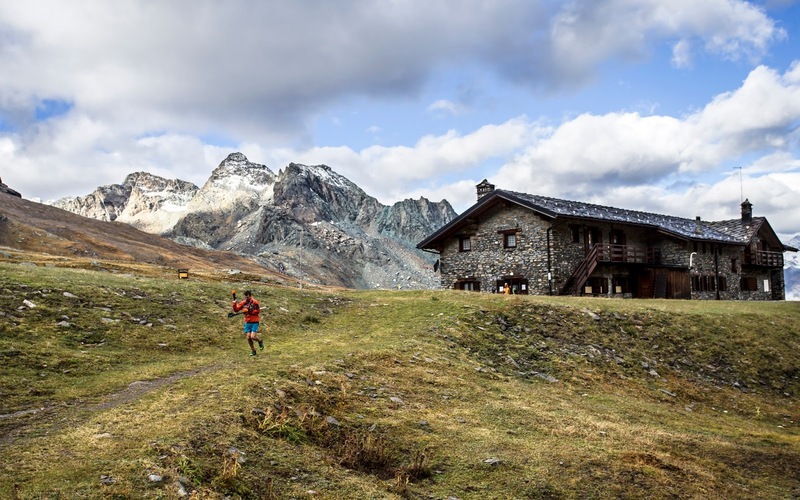 The French runner is almost home here: he trains on this paths, he takes part in lot of races around the Mont Blanc and he was on Tor podium 4 times. The three can now finally rest, but the road is still very long for all the other Giants! The race is temporarily suspended due to bad weather conditions. 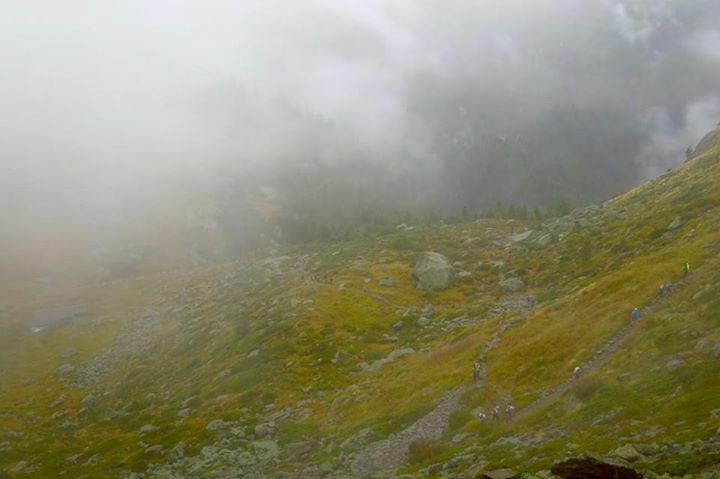 Race is still suspended due to poor visibility on some part of The paths. The race has been cancelled at 8.30 am: the weather forecasts are still prohibitive and they are gonna get worst during the day. The priority is and it is always been the safety of the runners. 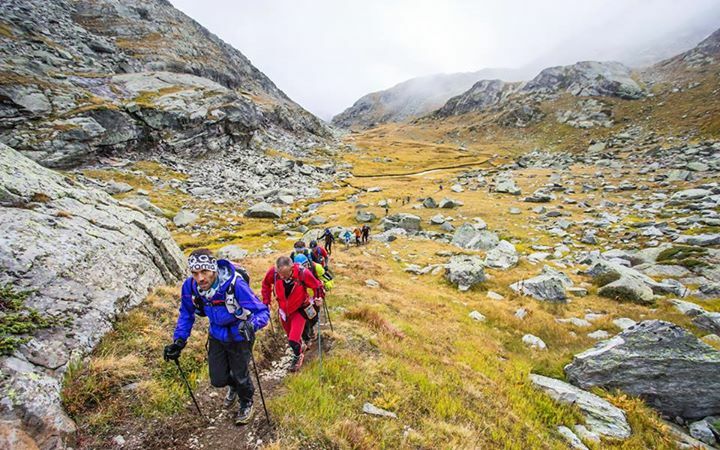 The race direction is organizing transfer to get everyone back to Courmayeur or to allow them to reach their own transfers. An official ranking will be drafted anyway, based on the timing of the runners in the last check point they passed through. 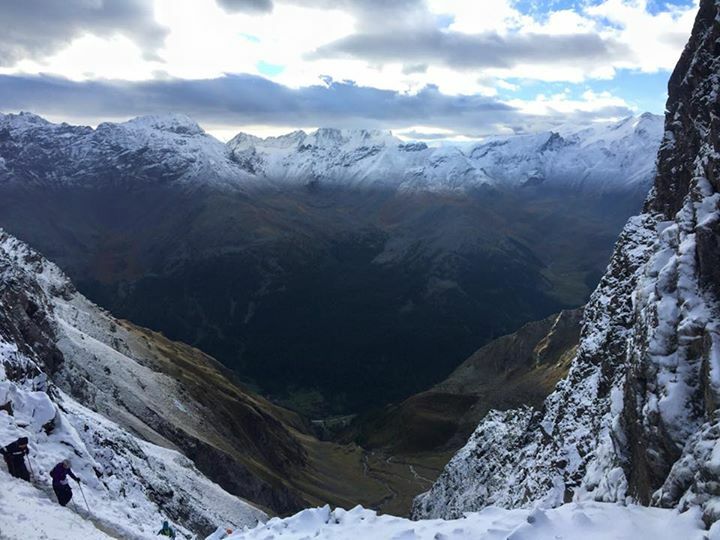 There will be an award giving ceremony, probably on Saturday: more information about that later, now the focus is to get every athletes to Courmayeur. Tudo, desde os que se propõem a fazer esta corrida, bem como os locais da mesma. E a reportagem também está muito boa.